As the 2011 summer movie season draws to a smooth closure, Jon Favreau's Cowboys & Aliens has arrived with a bizarre fusion of cowboys and alien invaders (you knew that already? Oh, I wonder how...). Does it manage to blend these two premises in an ideal fashion? Well, the answer is yes. And no. In 1873 New Mexico, a man named Jake Lonergan (Daniel Craig) awakes in the desert with a strange metal band attached to his wrist and no memory of his past. He soon stumbles across the small town of Absolution; not only discovering that he is a wanted criminal, but also witnessing a large group of extra-terrestrial invaders kidnap innocent locals. With the only weapon capable of fighting back, Jake must now lead a team alongside Colonel Woodrow Dolarhyde (Harrison Ford) to rescue the locals, defeat the enemy and, most importantly, find out where exactly he came from. Seeing the Western aesthetics juxtaposed alongside soaring CGI space ships isn't as crude as it may initially sound; it's something that may not seem ideal to some, but the visual side of this film is actually very impressive. A good selection of shooting locations help to set and maintain the Western vibe the movie exudes, a factor also complimented by some nicely crafted sets. It's all wonderfully shot, too; the camerawork often seems to draw attention to the expansive environments the characters often navigate through, which again compliments the Western spirit of the film. The CGI effects used when the extra-terrestrial villains enter the fray are also nicely done, but it's ultimately pretty generic and not as impressive as the aforementioned Western scenics. As we begin in the same situation as our main character, with no knowledge of his past, the story feels a lot more interesting. And it does unfold pretty nicely; well, for part of the film. It gradually explains numerous unanswered questions, and what it does explain is exactly the problem. I won't spoil, but let's just say there's a lot of really daft plot elements in here that not only feel incredibly tacky but also extremely cliché; for instance, the true motivations of our alien villains or the actual identities of some the characters. Speaking of the aliens, they're main problem is a complete scarcity of intimidation or mystery. There's simply no interesting substance to them because they're just generic creatures who never emit any sort of fear; not only this, but their dramatic entrances which spawn some of the set pieces (which, in fairness, are pretty awesome) are rather sporadic. When it comes to the characters, they are quite likeable, especially Lonergan and the Colonel, and they share a solid chemistry together. Well, as long as you ignore the incredibly bland romance that Lonergan and Ella Swenson (Olivia Wilde) share. A strong cast featuring Daniel Craig, Harrison Ford, Olivia Wilde and Sam Rockwell helps give Cowboys & Aliens a little more momentum with it's characters and, to a small degree, it's story. The performances are universally excellent, with Craig bringing a gritty yet somewhat comedic charisma to Jake Lonergan (not to mention providing a solid Western accent) and Ford establishing the Colonel as a warrior with a heart. The only real downside is the flat nature of some of the well acted characters; some of them are killed off quickly before trying to be established as an importance, but a few who remain are exceedingly uninteresting (Olivia Wilde comes to mind, despite her being really hot), yet sometimes the movie wants to take them seriously and try to act as if the audience genuinely cares for them. I didn't expect a masterpiece when I saw this movie, and what I eventually watched was certainly not that. 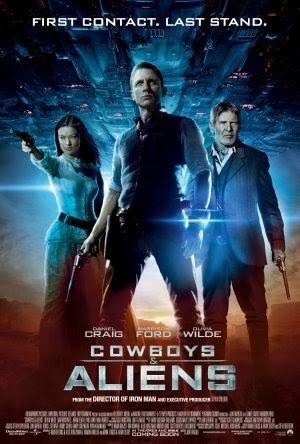 However, if you can bury through the flaws that Cowboys & Aliens suffers from, you'll uncover a reasonably solid and entertaining summer movie. Excellent visuals and performances help to redeem it from some of it's faults, but ultimately only those who were interested from the start should give it a watch.